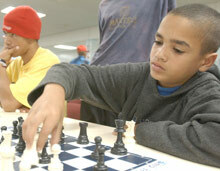 Mary Lloyd, “Chess Wunderkind Ricky has Right Moves,” The Cape Argus, 14 January 2004 (Cape Town, South Africa). Staring down at his pieces, Ricky Rossouw's huge, soft eyes make him instantly endearing, but don't be fooled. By all accounts, the 11-year-old is a demon; a demon chess player, that is. "It's intimidating for older guys to lose to him," says Eugene Steenkamp, chairman of the Elsies River Chess Club, where Ricky practises three times a week. Tipped by the team captain as the club's most promising player, Ricky has come into his own in the past year, causing two upset wins at a league tournament and stunning seasoned chess players. At the Elsies River Library, where the club meets, Ricky was recently spotted by the former president of the South African chess body and invited to a tournament for underprivileged kids. His enormous talent was quickly recognised by Nick Barnett, chess columnist for the Cape Argus, who decided to show him chess's most famous game. The daring match, played by 20-year-old American genius Paul Morphy some 150 years ago, fascinated the youngster. When challenged to find the winning move, he spotted it straight away - a queen sacrifice. To see how well Ricky had actually understood Morphy's strategy, Barnett then asked him to play through the game. "This kid managed it first time," Barnett said. Following the tournament, a story ran in the UK press quoting chess enthusiasts saying Ricky should go to England for specialist training. It was his older brother Angelo, 16, who first encouraged Ricky to play chess three years ago. They can both be found playing chess most afternoons at the Elsies River Library, where the club provides tutoring and sets up matches for anyone interested in the game. Because equipment is limited, blitz games are played so that everyone can have a go at a five-minute match. "It's adrenaline pumping," says Steenkamp, who likens this form of chess to arcade games. He believes it is the fast pace of these games and the need for quick thinking that keeps youngsters coming back. Improved discipline and focus are two other effects Steenkamp is quick to point out. Ricky explains it simply: "It opens up my brain cells." Academics concur. Research by Dr Robert Ferguson of Bradford in the US shows that chess improves children's' ability to think rationally, increases cognitive and communication skills, results in higher grades in languages and mathematics, and fosters a sense of self-worth, commitment and responsibility for one's actions. A look at Ricky's grades supports this theory. He achieved an A in maths and two Bs for geography and natural science. Ricky is in Grade 6 at JS Klopper Primary School. Ask Ricky what he wants to do when he grows up and he replies with determination: "To play chess professionally." And his main ambition? To beat Kenny Solomon, the current South African champion, who hails from Mitchell's Plain. "We're behind him 100%," says Steenkamp. With limited resources, the club is struggling to seize all the opportunities open to them. They currently have only two clocks, and Steenkamp says they need 18 more for all members to take part in competitions. A few of their players were selected last year for the Western Province team that competed in Bloem-fontein, but were unable to go as they could not pay for the trip. With help from the Golden Arrow Foundation, however, the club held an open tournament, which allowed their members to compete with the South African champion and other top 10 players. This year they will again be looking for sponsorship. For more information call Eugene Steenkamp on 083 945 3484.